Black Friday is here with an online coupon! Black Friday is here. We’re open, and we’re servicing the nation. Looking for a fantastic deal today to get your cracked iPhone repaired? How about that smashed screen on your iPad? Mission Repair is offering 15% off every new repair order today 11/27/15 until midnight when you place your order online. Remember, we service every address in the United States and we’re proud of it. Use coupon code “BFRIDAY15” to get your discount today only! Good luck out there. Remember, if you call in to place your order, we have limited hours from 6:00am – 2:00pm today 844-459-0105. Computer logic board repair at Mission Repair. Every day we receive Macs and PC’s in for repair; and some times there are subtle issues that are bigger than one might think! Recently I had a very nice customer that was simply trying to install a new solid state storage drive into his 17″ MacBook Pro; but the computer wasn’t wanting to install any new software. The tricky part about this computer is that pretty much seems like it’s OK until you try to install software. Wow…there is just something wrong with the “logic” in this logic board! So a little bit of surface mount rework and we will have this unit back and running perfectly for the customer. I just want to let you know that a failing logic board can show it’s ugly head in a lot of ways. It can have no power, distorted video, not reading the memory or hard drives correctly and a myriad of other possible issues. Just keep these things in mind if you’re having computer problems, and that Mission Repair can solve them. Good afternoon again friends, I’m getting a lot of blogging done today that has been built up on my “to do” list for a few weeks. I’m sorry that I’m hitting you all at once, but I found some time to get my typing done today. 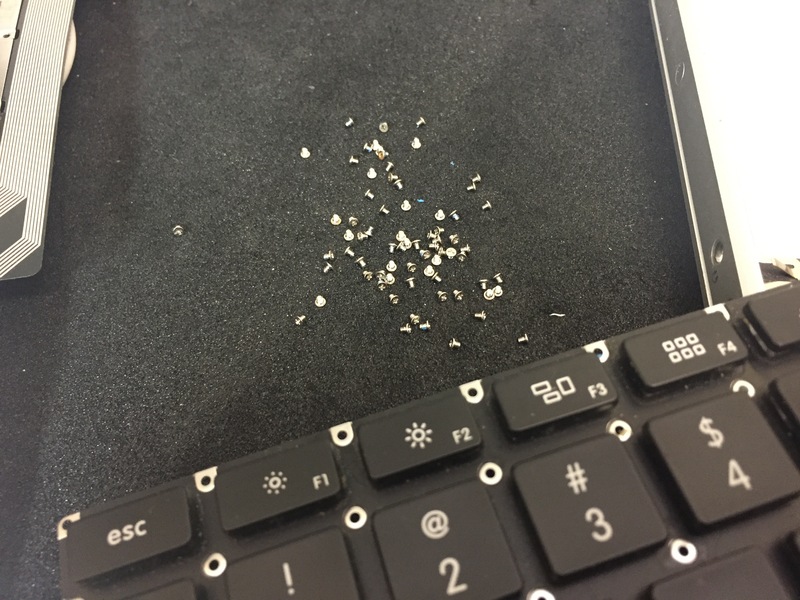 Recently, I was working on a 13″ MacBook Pro (Unibody) that was sent into us damaged. Of course we can repair this; however in this particular case the customer asked us NOT repair fix the “cosmetic” damage and just work on the electronics. Here’s what I found out about this unit. As Forrest Gump might have put it, “Fluids is as fluids does.” Thinking of liquids helps us understand how air flows. For all general purposes, air flows just like water. Flow will inevitably follow the path of least resistance. That means the flow will usually take the shortest, unrestricted path from the point of high pressure to the low pressure area. Take this “cosmetic damage” for instance. Yes, we can repair this unit and leave the “dents” in the side of the unit. However when I tested it, the fans that cool the logic board were turning on pre-maturely. Most of the air was being pushed out of this “cosmetic” hole in the side of the computer, rather than through the vents on the back which ensures that the air flows OVER the logic board and CPU to keep it cool, rather than AROUND it. Why was this unit failing? It’s because the fans were not able to keep the internal components of the computer cool enough to operate under specifications and therefore overheating. This is just a friendly post to keep in mind that these devices are meant to be “whole” when operated, and that the art of airflow applies to your expensive electronics, there’s no doubt about that.